Tom Hanks & Wife Rita Wilson Enjoy a Boat Ride With Gayle King in Italy! Tom Hanks and Rita Wilson are hitting the high seas! The Castaway actor and the Sleepless in Seattle actress were spotted visiting the Blue Grotto on Friday (August 3) in Capri, Italy. The longtime married couple took a boat ride from the Marina Grande alongside their friend Gayle King while enjoying an Italian holiday break together, visiting a sea cave on the coast of the island of Capri. The two recently showed their support for Tom‘s The Post co-star Meryl Streep at the Mamma Mia! Here We Go Again premiere at Eventim Apollo earlier in July in London, England. Cher & Meryl Streep Reunite at 'Mamma Mia! Here We Go Again' London World Premiere! 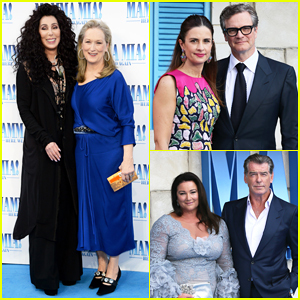 Cher and Meryl Streep hit the blue carpet together while attending the world premiere of their anticipated film Mamma Mia! Here We Go Again held at the Eventim Apollo on Monday (July 16) in London, England. The superstars, who both starred in 1983′s Silkwood together, were joined at the event by their co-stars Pierce Brosnan, Colin Firth, Christine Baranski and Stellan Skarsgard. Also in attendance to show their support was Meryl‘s The Post Tom Hanks and his wife Rita Wilson, Andy Garcia, Pierce‘s wife Keely Shaye Smith, Colin‘s wife Livia Firth and Stellan‘s wife Megan Everett. FYI: Meryl is wearing Vista Sun sunglasses, Norman Silverman Diamonds earrings and a ring by Carelle. Christine is wearing Lorraine Schwartz Jewelry. 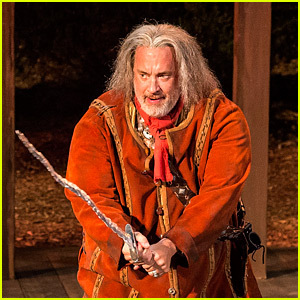 Tom Hanks is currently starring in the Shakespeare Center of Los Angeles’ production of the play Henry IV and you can check out production photos right here! 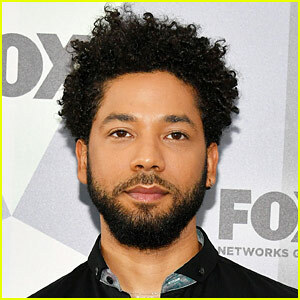 Appearing alongside the two-time Oscar-winning actor are Hamish Linklater, Harry Groener, Joe Morton, and Rondi Reed. The 24-performance run is set to end on July 1. Just like Shakespeare in the Park, which is performed in an outdoor theater in New York City each summer, this production is held outdoors at the West Los Angeles VA Campus. The Shakespeare Center is providing thousands of complimentary tickets for veterans and active members of the military. The general public can grab tickets at ShakespeareCenter.org! 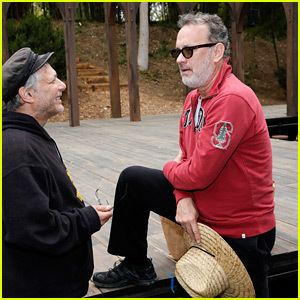 See Photos of Tom Hanks in Rehearsals for 'Henry IV' in L.A.
Tom Hanks chats with Ben Donenberg, the artistic director of The Shakespeare Center of Los Angeles, during a recent rehearsal for the new production of Henry IV! The two-time Oscar-winning actor is making his Los Angeles stage debut as Sir John Falstaff in the classic Shakespeare play. The cast also features Joe Morton, Hamish Linklater, Harry Groener, and Rondi Reed. The play, which is performed outdoors, is running now through July 1 at the Japanese Garden on the West Los Angeles VA Campus and tickets are on sale now. Tom Hanks & Rita Wilson Invited All the Stars to Their Anniversary Celebration! 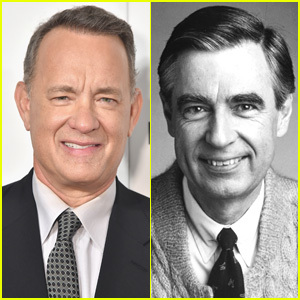 Tom Hanks to Play Mr. Rogers in Biopic on 'Mister Rogers' Neighborhood' Star! Tom Hanks is set to star in a biopic, portraying Mr. Rogers aka Fred Rogers. The biopic, titled You Are My Friend, is inspired by the “real-life friendship between Fred Rogers and award-winning journalist Tom Junod. In the story, a cynical journalist begrudgingly accepts an assignment to write a profile piece on the beloved icon and finds his perspective on life transformed,” Variety reports. Fred hosted the popular kids program Mister Rogers’ Neighborhood from 1968 to 2001. Fred Rogers passed away back in 2003. The biopic will be directed by Marielle Heller with a script by Micah Fitzerman-Blue and Noah Harpster. No release date or additional casting has been revealed just yet. Stay tuned!